Together we ensure smart mobility for tomorrow. Would you also like to participate in Trendsportal? Gladly! Our great strength is a strong, growing network. This is why we are open to everyone who feels personally or professionally involved in traffic and transport issues in North-Limburg. Be heard, think along and participate! 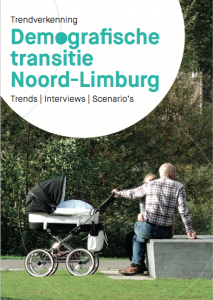 The future of Mobility in North-Limburg is not something you ‘consider’ on your own. Along with companies, residents and stakeholders, the 8 initiating municipalities from North-Limburg form Trendsportal. A network that now consists of about 70 professionals and is still growing. Your logo here? Mail your logo to info@trendsportal.nl. "Compliments for two very enjoyable and very well organized days!" "Unfortunately, I could only be there for one day. I thought it was a great day. Well organized, creative and fun groups." "Thanks for the interesting and constructive days on several fronts! A huge thank you." The pilot project ‘Young Motorists, Tailor-made Driving training’ has been running for four years now, with the aim of reducing the number of road casualties among young motorists. The pilot is an initiative Trendsportal together with the Regional Body Traffic Safety Limburg and with support from local partners Ruud Rutten Verkeersopleidingen (Traffic Training) and Autorijschool (Driving School) Wim Ummenthum. The methods and processes have recently been presented at the CIECA congress in Norway and are now being adopted by VEKA Best and probably in the fall by Centraal Bureau Rijvaardigheid. Young Motorists are now five times more likely to get involved in an accident. They are more often involved in one-sided accidents, are more likely to lose control of the vehicle, are more likely to drive at too high a speed, are more involved in accidents over the weekend and more often have an accident when they transport passengers of their own age. Traffic is therefore the major cause of death in young people between the age of 17 and 25! Unlike the current driving courses, the approach of Young motorists, Tailor-made Driving Training’ starts before the driving lessons and continues after obtaining the driving license. The approach consists of three additional components. Youngsters are tested for their attitude (mental attitude) while driving. In addition, simulation techniques are used, both for teaching basic skills and for training hazard recognition. Plus youngsters learn to evaluate their own progress using self-reflection techniques and by receiving feedback from students. Jan Vissers of Royal Haskoning DHV presented a number of tests developed within the project during the CIECA congress. Tests that can measure objectively with what attitude a driver drives and therefore have a predictive value for the driving behavior and accident risk of a young motorist. Based on this customized driver training can be offered. The acquired portfolio of the candidate also provides insight into the progress and could even serve as additional information during the driving exam. Curious about the presentation? View it here. During the CIECA congress the principle agreement was made with the general director, Petra Delsing, of the Centraal Bureau Rijvaardigheden (CBR), that the developed methods and techniques would be made available to the . For use in the development of the ‘New Driving Test’ and to use with the course of the CBR for drivers who have (temporarily) lost their driver’s license due to irresponsible driving behavior. Until the fall the CBR will analyze the methods and techniques of the pilot further, followed by a follow-up interview. VEKA Best has already developed the pilot in practice in the driving training method for driving schools, under the name Drive! This way the pilot contributes to safer road traffic in North-Limburg and the Netherlands and the goal of Zero traffic victims is one step closer! #MVD01. The municipality of Horst aan de Maas finds traffic safety to be very important. This is seen in the well-equipped infrastructure, but also in the many traffic measures that they take annually. In addition, customization is performed at unsafe locations. We notice, however, that the possibilities are increasingly limited to really make a difference. An important component in traffic safety remains; man; and more specifically, mans behavior. The municipality of Horst aan de Maas is, as one of the first municipalities in our country, structurally committed to influencing behavior. The municipality of Horst aan de Maas would like to work harder on positively influencing the behavior of the road user. In addition to the infrastructural measures, the municipality wants to focus more on traffic education and information/communication in order to further improve road safety. The general goal of influencing behavior is: To teach and stimulate safe behavior by providing road users with knowledge, attitude and motivation through an integral, structural approach. Our project has a two track approach to achieve our goals. After a problem analysis or on the basis of accident figures, a specific theme can be picked up. Examples; elderly people on the road (e-bike use), safe school zones or 60 km roads. We have held a work session with stakeholders (including city councils, schools, ROVL). Here several topics were aired which they consider important. In January the Plan of Approach will be presented to the Spatial Committee. Then we will organize plans during external and internal interactive sessions to reach the various target groups. Interested in this pilot? Send an e-mail to Ton Peeters. Also curious about the facts and figures on mobility in your area? Take a look in the Geographic Information System (GIS)! In this interactive system you will find various data about traffic and transport in your area. You can search or filter on all kinds of locations, themes and indicators. How many cars drive on the A73 every day? How is the bicycle accessibility of the hospital? You can find it in the GIS. Do you have questions or do you need help? Contact Trendsportal via info@trendsportal.nl. We would love to help you in your search! What does the demographic development mean for the perspective in the area? The world is changing. Aging is increasing, but the population is declining. But what does this mean for the North-Limburg region? The municipality of Venlo, municipality of Horst aan de Maas, RMC North-Limburg and the province of Limburg commissioned Ruimtevolk to conduct research on this. The results have been translated into trends, opportunities and challenges that will arise in the future for the region of North-Limburg. Below is an overview of the trends for mobility. Curious about the total report Trend exploration demographic transition N-L_web? Larger action range: Larger range: In the past we have shown that with innovations in mobility, through which we could bridge a distance more quickly, we did not spend less time traveling. The time we travel on average per day has remained constant and we are now traveling over a greater distance. Motive and modality: On average a Dutchman travels 32 kilometers per day and therefore spends 63 minutes per day on the road. Most kilometers are traveled to and from work. Regional differences: Limburgers travel a shorter distance per vehicle than on average in the Netherlands. This is striking for a peripheral region. Public transport: Approximately 13 percent of the number of kilometers and the duration of the journey is allocated to public transport. The main users of public transport are pupils and students and workers. Older people do not use public transport more often than other groups. The rise of the bicycle: The bicycle is gaining popularity. This is evident especially in larger cities, but thanks to the rise of the electric bicycle, also in smaller cities and rural areas. Electric bicycles are being used more and more, especially by seniors. Older people and vehicle traffic: Because a large part of the traffic involves commuter traffic, vehicle traffic will decline with the aging of the population. The future generation of older people are however more prosperous, vital, active and mobile than previous generations. Road safety: A larger share of older people on the road will also have a significance for road safety. Older road users involve risks. Expressly linking the developments in accessibility by public transport to effects on the residential attractiveness in areas within the region. Investigating transport poverty within the region and – where possible – finding solutions for this. Monitoring and controlling the effects of the aging of the population on mobility and traffic. 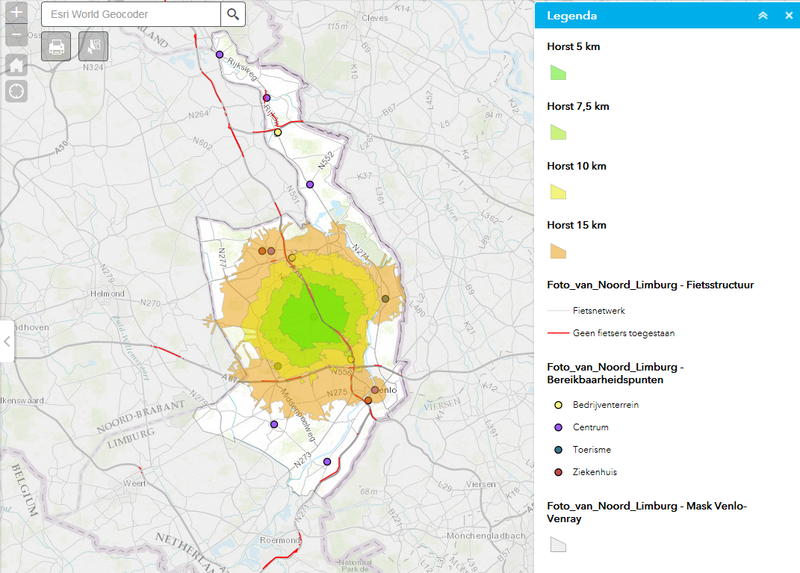 Opportunities that offer innovations in mobility for North-Limburg.